If you bring medications with you, pack them in their original, clearly labelled containers. You can also bring with you a signed and dated letter from your physician describing your medical conditions and medications, including generic names. Especially if you carry syringes or needles you need to have a physician’s letter documenting their medical necessity. If you have a heart condition, bring a copy of your ECG taken just prior to travelling. Also bring double your needs of regular medication, in case of loss or theft. 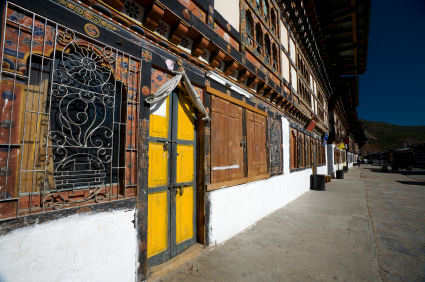 You can’t rely on many medications being available from pharmacies in Bhutan. Specialised travel medicine clinics are your best source of information; they stock all available vaccines and will be able to give specific recommendations for you and your trip. The doctors will take into account factors such as past vaccination history, the length of your trip, activities you may be undertaking and underlying medical conditions such as pregnancy. Most vaccines don’t produce immunity until at least two weeks after they’re given, so visit a doctor four to eight weeks before departure. Ask your doctor for an International Certificate of Vaccination (otherwise known as the yellow booklet), which will list all the vaccinations you’ve received. The World Health Organization has the excellent and annualy revised book ‘International Travel & Health’. Bhutan doesn’t have private health clinics or physicians, but all district headquarter towns have a hospital. In case you get sick, Thimpu’s Jigme Dorji Wangchuk National Referral Hospital is the best facility. Treatment is free, even for tourists. In rural areas it’s difficult to find reliable medical care, so you best take a first aid kit with you. Most large towns have shops selling medicines. Many of these are available without a prescription. Watching what you eat and drink is always the best remedy. Don’t use ice cubes and don’t drink tap water, it is best to drink bottled water, opened at the spot. If you can’t buy bottled water, then boil the water for at least 5 minutes. Be cautious with salads and food from a roadside shed, and make sure food is well heated before consumption. If you have diarrhea, use Oral Rehydration Salts (ORS). Never travel without health insurance, even if you are fit and healthy. Accidents do occur and then you at least don’t have to worry about your insurance costs to be well covered. Emergency evacuation is very expensive if you are not or not well insured. Some policies ask you to call back (reverse charges) to a centre in your home country where an immediate assessment of your problem is made. You may need extra cover for adventure activities such as rock climbing or rafting. If your health insurance doesn’t cover you for medical expenses abroad, consider getting extra insurance.